Let me start by saying I’m an M. Night Shyamalan fan. I love The Village and The Sixth Sense. Signs is one of my favorite movies of all time. Unfortunately, his last movie Lady in the Water wasn’t so great. It had an interesting premise. I didn’t love it, but I also didn’t hate it like most people did. I had high hopes for The Happening. It was M. Night’s first foray into the R-rated territory. The TV spots and the red band trailer looked great. Sadly, I was disappointed yet again. 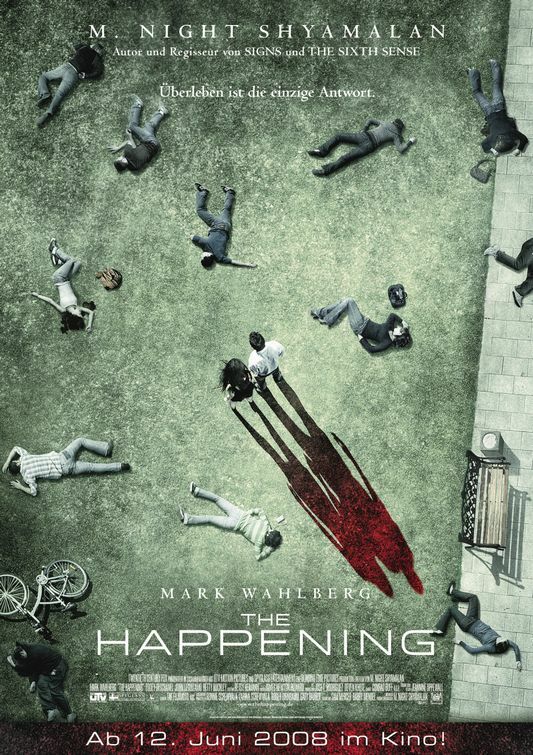 Yet another international poster for M. Night Shyamalan’s The Happening is available. This one’s all blue and swirly. I prefer the super depressing one we saw earlier today. I just love the use of the red in the shadows of the people still standing. I’d like to think it shows that they’re doomed too. 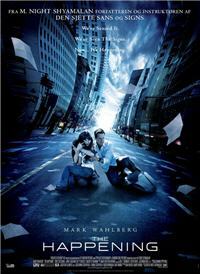 The Happening stars Mark Wahlberg and John Leguizamo and will be in theaters June 13th. The Happening hits theaters June 13th. 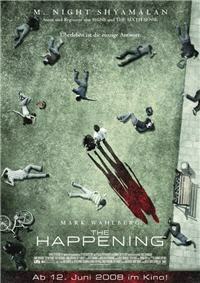 We had previously seen a trailer for M. Night Shyamalan’s The Happening earlier this month. This new one shows less of the horror/thriller part of the movie, and more of the character story. https://www.youtube.com/watch?v=EgnmzJZrgqwThe Happening will be released June 13th, 2008 and stars Mark Wahlberg and John Leguizamo. I’ll be the first to admit I’m a bit of an M. Night fangirl – I actually liked Lady in the Water and I count Signs as one of my Top Five movies. Needless to say, I’m psyched for his upcoming movie The Happening, but it actually looks really good. The poster was awesome. Now /Film has the trailer, which is even more awesome. It looks like New York City starts going crazy and killing themselves. So Marky Mark becomes a hero. At least, that’s what I’m guessing. There’s going to be a twist, I’m sure – something about how everyone’s connected and it was Marky Mark’s destiny to save the world. But I’m ok with that. And so help me, if one crazy gets on the news talking about how a movie about an insane New York reminds them of September 11th, I’m going to scream.